Its beaches are stunning: turquoise waters lapping against pale sand and dramatic white cliffs; its capital is sophisticated and packed with great places to eat and drink, it's small but there’s plenty to do and varied Greek Island views, so why does Lefkada remain one of the Ionian group’s least touristy destinations? And where are the best places to stay on Lefkada, this pristine Greek island paradise? Lefkada is called an Ionian Island, but it's actually connected to mainland Greece via a narrow causeway and small bridge. But even this easy access hasn’t flooded the island with visitors. Lefkada’s small airport is still the main point of entry, and you can find many of the best places to stay on Lefkada around 30minutes drive from the airport. The Beaches - there are so many it's difficult to choose... but Egremni beach has an almost Caribbean-like feel with its white sand and turquoise waters, and it is conisdered to be one of the most beautiful in the Mediterranean. And, if you fancy it, the watersports - from jet skiing and wake boarding to banana boating or paragliding. The mountain biking is also amazing. It's a hilly island and there are plenty of trails for enthusiasts of all abilities. It's easy to hire bikes and to book guided day tours. Lefkada town is also worth visiting, and if you're interested in pretty villages where time has stopped then head for the hills and the tiny bays and inlets. One thing which might put some people off are the winds. Lefkada is the windiest ionian island by far, and its larger coastal towns of Vassilike and Nydri, where there are large open bays, are extremely popular with watersports-folk. But the winds keep Lefkada cooler than its neighbours during the hottest summer months - in a good way! And there are plenty of beautiful small ports and hamlets to stay in if your idea of the best places to stay on Lefkada involve quiet beaches and coves. If you’re looking for the perfect beach break destination on Lefkada you might find some of the best hotels on Lefkada are close to the stunning Porto Katsiki or Egremni Beach, which are probably the beaches most often voted for as Lefkada’s finest. If you’re looking for a family beach holiday look around the northwest coast where there are a number of smooth, sandy bays with gentle gradients. Pefkoulia is one of the nicest beaches and it's close to the shops and restaurants of Agios Nikitas. If you’re looking for a place to relax check out the pretty little port towns of the Sfakiotes region. These seven hamlets and villages have been slow to change over the centuries and there's a wonderful sense of traditional hospitality - usually centred around the local taverna. And they're only about a kilometre from their nearest neighbour, through ancient olive groves and past crumbling windmills, so you can easily visit them all. If your idea of the best places to stay on Lefkada involves the feeling of having your very own patch of island head off past Porto Katsiki to Cape Lefkada, there's nothing here but dramatically sheer drops and views to Kefalonia and Ithaca. The San Nicolas Resort is a great option if you want to get away from it all, but still have luxurious contemporary surrounds and all the mod. cons.. Built on a hillside this hotel has incredible sea views - on a good day you can see neighbouring Kefalonia and Ithaca, a stunning pool and it's just a short stroll to the beach. The Aliki Hotel is a quiet, great value, 22 room hotel with wonderful views of the beautiful Ionian Sea. The rooms are comfortable and you’re well located for the beach. Prices start from just €70 per night. Lefkada’s airport, Preveza/ Aktion only operates in summer, and is only used by chartered and low-cost airlines from European destinations, with the occasional internal flights. Lefkada is part of a ferry service which links the Ionian islands, so you can also arrive by ferry from one of the larger islands. Like its Ionian neighbours, Lefkada enjoys a Mediterranean climate of long, hot, dry summers and mild winters, but it’s significantly windier here. Summers of sunny days and calm seas stretch from May through to October, and the wind keeps it from getting too hot. Even in the hottest months, July and August the mercury usually stays below 30°C. Come October you can expect a bit more rain, so if you want to visit when the island is looking its gleaming best then March through September are probably the best months to visit. And in September the prices are low and you’ll have some of the world’s best beaches to yourself. If you haven’t driven your car across from the mainland and want to hire one, which is a good idea since public transport is pretty infrequent, we recommend you visit our online partner, Rentalcars. If you’d prefer to stay in a seaside apartment or private villa we recommend you visit our online partner, Booking.com where you’ll find an excellent range, whether great value or utmost luxury is your priority. Still not sure which is the best place to stay on Lefkada for you? 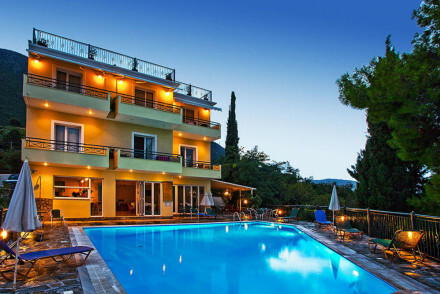 A delightful hotel on the beautiful island of Lefkada. Its stand alone feature is the phenomenal view it commands over the Ionian sea, which can be taken in from almost anywhere on the property. Perfect for a tranquil break on a Greek island. Romantic Break - With stunning sea views and comfortable rooms it's the ideal spot for a quiet, romantic break on the Greece island of Lefkada. Diving - Scuba diving enthusiasts will love some of the diving spots off Lefkada. Sights nearby - The hotel sits just three miles from Onassis Statue. A gorgeous contemporary classic hotel with stunning seaviews. Rooms and suites in white and pale blue have private balconies and all the mod cons. Stunning pool and relaxation area, and a short distance from the beach. For romantics and sun seekers.